With those words from its newly invested president, the University of Cincinnati celebrated its 28th chief executive, Santa Jeremy Ono, on April 19. Addressing the assembly in Corbett Auditorium at UC’s College-Conservatory of Music, Ono emphasized the importance of core values to the continued vitality of an institution. Building on the metaphor of the flag, Ono related the origins of “The Star-Spangled Banner” to a battle in the War of 1812, a battle that took place in Baltimore, a city Ono often refers to as his “hometown.” The flag, he said, is associated with our nation’s core principles of freedom and justice for all, emblematic of what it means to be American. After a reminder of UC’s distinguished history from William Howard Taft through Albert Sabin and Neil Armstrong to modern initiatives including UC Forward, Ono pledged to ensure that the University of Cincinnati would remain an institution focused on transforming lives, creating new knowledge, and being a global change agent. Traditionally, in higher education, a university or college president is invested, or formally installed, during the first 12-18 months of service. The investiture ceremony gives the university community an opportunity to recognize and celebrate its new chief executive. The installation ceremony can be formal and traditional, filled with academic ritual and protocols. 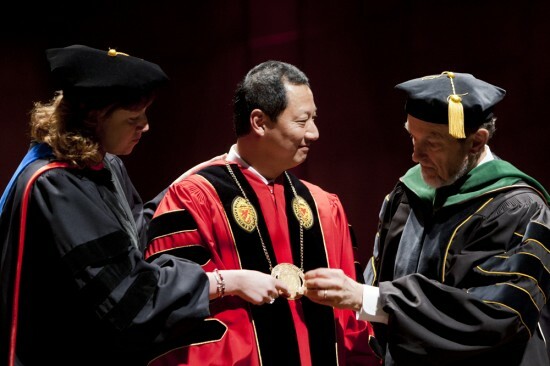 Ono’s ceremony featured an academic procession with delegates representing other colleges and universities, members of UC faculty, as well as UC deans, the President’s Cabinet and the university Board of Trustees. Marchers wore the colorful academic regalia of their own institutions. Interspersed with musical selections, there were greetings from UC’s Board of Trustees, the Ohio Board of Regents, other university presidents, UC’s academic community and students. Immediately following the investiture ceremony, the UC community gathered for a “#Celebrate28” pep rally to officially greet and congratulate President Ono on this historic day. The pep rally in the atrium of Tangeman University Center was named as a reflection of President Ono’s expanding reputation as an avid and effective user of Twitter and other social media. In addition to being the name of the pep rally, #Celebrate28 was one of two designated Twitter hashtags used to discuss the investiture, along with #CongratsSanta. Representatives of the UC community, including students, faculty, staff, alumni, donors, deans, and vice presidents along with business and community leaders gathered for a celebratory luncheon. Ono was appointed to UC’s presidency on Oct. 23, 2012. He first arrived at UC in 2010, serving two years as the senior vice president for academic affairs and provost. As provost, he led the development of an Academic Master Plan (AMP) aligned to the university’s strategic plan, UC2019. He also serves as professor of pediatrics within UC’s College of Medicine and professor of biology in the McMicken College of Arts and Sciences. Ono’s principal research interests focus on transcriptional regulation in the human immune system, mechanisms of mast cell dependent inflammation on the ocular surface and the immune component of age-related macular degeneration. He is the first Asian American to serve as UC’s chief executive and one of only a few Asian Americans to serve as president of a major research institution in the U.S. Prior to his appointment as provost at UC, Ono served at emory university as vice provost for academic initiatives and deputy to the provost and then senior vice provost for undergraduate academic affairs, also serving as professor in the Department of Ophthalmology, Emory University School of Medicine. Earlier in his career, he also served in a variety of teaching, research and administrative positions at the Johns Hopkins School of Medicine, Harvard Medical School (and the Schepens Eye Research Institute), University College London and Moorfields Eye Hospital in London. View the investiture ceremony on YouTube. View the investiture photo gallery. Read President Ono’s investiture speech. President Ono is not only a great Asian-American role model. He is one of the country’s very top university presidents and a great American. UC has a giant in their President. He can be the president of any college and has the potential to become a national figure. UC had better do all they can to keep him in Cincinnati for as long as they can. He will be very hard to replace.